Rose gets the course rolling by starting to cut the cakes to the correct size and shape for the fishing basket. You can use the template (found below) as a size guide or be creative and base the design of your basket on one you’ve seen elsewhere. Rose also stacks and levels the cakes in this lesson. 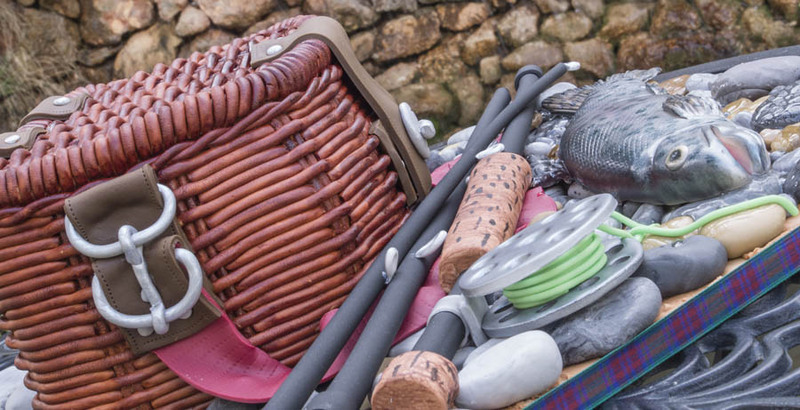 Tip: Try Google searching images of real baskets and rods or fishing tackle etc. 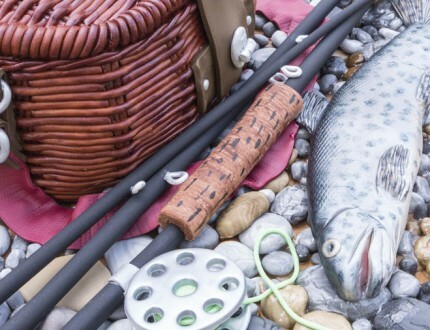 to assist with your creativity when designing your own fishing theme cake. In Lesson 2, Rose takes you step by step when icing this cake and how to achieve a neat finished result. To start the basket weave effect you first need to mark out and prepare the vertical sections of the weave, pay close attention to this lesson and the lessons that follow, to produce an absolutely amazing weaved basket finish. Continuing on from Lesson 3’s vertical sections, it’s now time to build up the horizontal sections of the basket weave. It’s quite a long process but you will definitely start to see the effect come together into something special. The weave effect is almost done, Rose shows you how to finish off the weave on the sides of the basket and then moves on to adding the same basket weave effect to the top. Once this is completed Rose also guides you through the painting of the basket which adds to the super-realism of this cake. Using the template provided follow the steps in this lesson to create the straps for the fishing basket. This lesson uses the stitching tool to provide an extra level of realism to the straps. 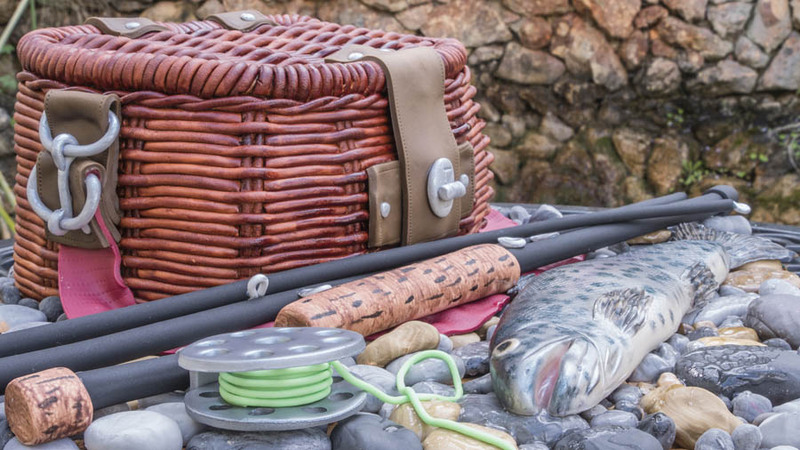 Follow this lesson to guide you through attaching the strap pieces to the fishing basket. Use the upright basket weave sections as a guide to centre your strap pieces. 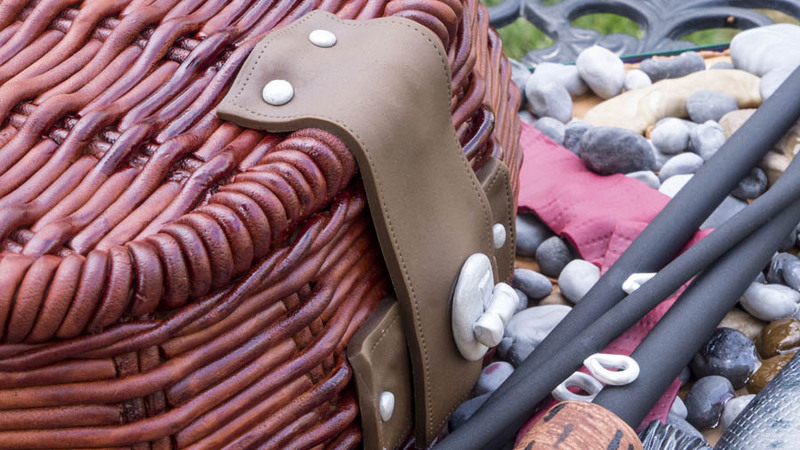 Finer details are also created in this lesson out of sugarpaste, this includes the clasp section of the basket. 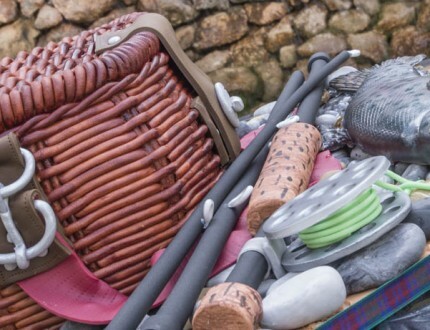 Making edible pebbles and stones has never been easier! 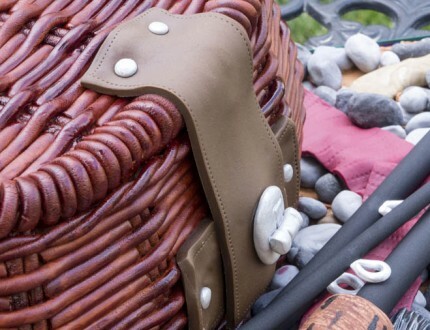 Follow the video lesson and the colouring techniques to create your own authentic looking pebbles and stones that make this cake looks like it’s on the side of a real river bed. Decorating the board using a coloured royal icing helps produce the sandy and muddy colour. This makes the stones and pebbles made earlier really look right at home. The royal icing also works as a glue in this phase, allowing the stones and pebbles to be placed securely on the board. Rose shows you how to create a shoulder strap for the bag, this also uses the remainder of the strap sections as a place for the strap to be attached. Now it’s time to model the fish, the fish in this course is based on a Rainbow Trout. 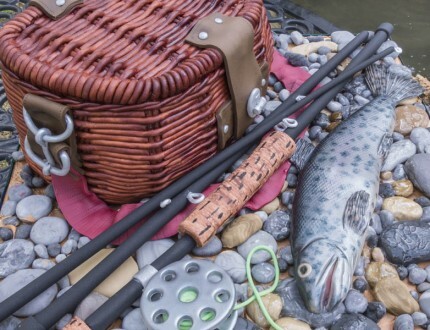 Rose uses an image of a Rainbow Trout found on Google images, keep referring to an image to get the model looking just right. 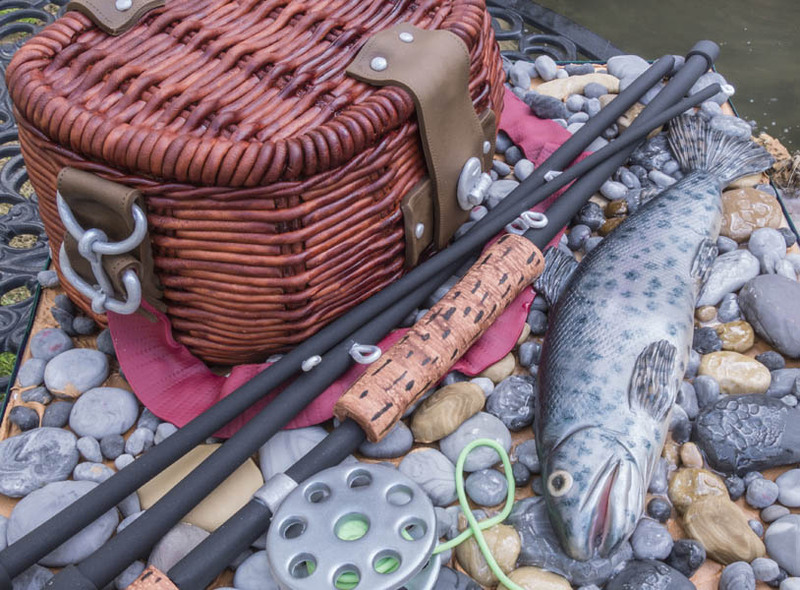 Rose uses an image of a Rainbow Trout found on Google images, keep referring to an image to get the model looking just right. This section covers some detailing on the fishes head and also adding the scale effect to the fish. To achieve the most realistic looking fish, go to your local fish monger and buy the actual fish, so you can create an exact replica. Once the fish body is textured, it’s time to create a tail for the fish and blend this onto the existing body. Rose also starts some base colouring of the fish. 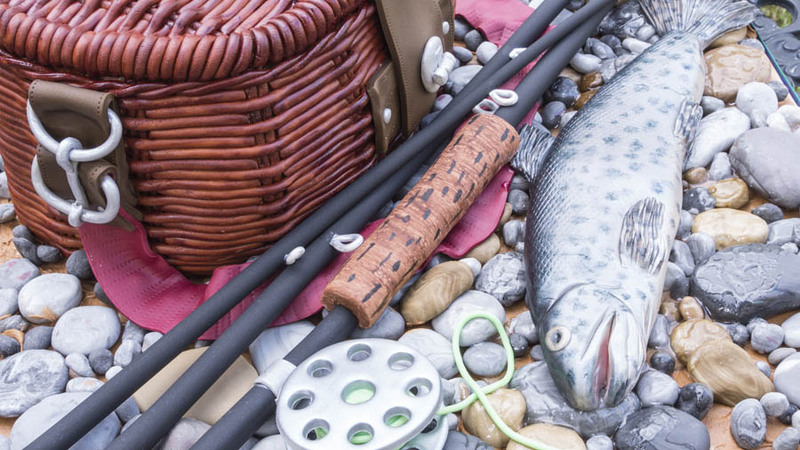 This section is important and gives the fish that ultra-realistic quality. Rose uses a pearl, silver and black lustre spray for the different areas of the fish. Remember to clean the nozzle frequently so you don’t get any unwanted splodges of lustre on the fish. The realistic effect is finished off using some brush shading techniques. Rose adds a touch of colour to the fins to bring the fish to life (sort of) a little bit more! Lesson 16 starts the creation of the fishing rod, your cake smoother will come in really handy here! NOTE: Apologies for the audio quality in this section. Using two cake smoothers you can press the fishing Rods to ensure they dry straight and level. Following this, and using flower paste, you can then move on to create the loops where the fishing line would pass through. Using some of the paste from the creation of the basket combined (with some Tylo powder mixed in for added strength) the handle can now be created. A small section will need to be cut from the fishing rod (around 6″ in this case) this will then allow the handle to be attached (see lesson 20 for more information on this). 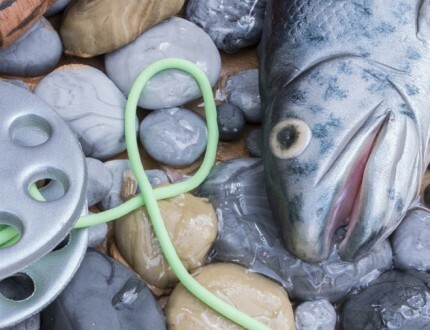 The fishing reel is created using flower paste. 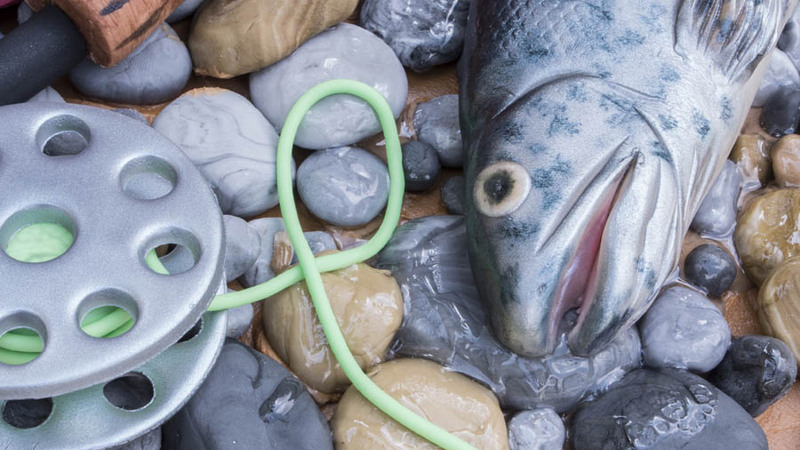 A 3″ cutter is used to produce two circles, then circular sections are taken out with plunger cutters, this gives the reel that authentic fly fishing look. Lesson 20 covers the adding of the handle and then placing the fish and details on the cake board. Some realistic wet patches are also added using piping gel, this is applied directly to some of the pebbles and stones around where the fish will be placed. Rose now creates fishing line using a clay gun, this produces a great result and allows for an accurate looking fishing reel. The assembly of the fishing reel is covered in this lesson along with some finishing touches to the cake. Paul joins Rose to talk about some other ideas for this cake. Paul joins Rose for the Pro lesson, starting with the pricing for this cake (and regional differences) and going into more detail about how to display this cake and some advice on preparing such a detailed cake. This weeks course features a very special guest, Rose from Rose-Maries Cakes and Sugarcraft. 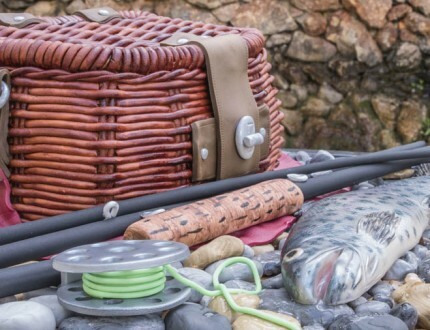 Rose is a multi-award winning cake designer who specialises in super realistic cakes and we’re certain you’re going to love recreating this amazing Catch of the Day fishing cake – perfect for a fishing fanatic! Since decorating her first cake in 2007, Rose now has a spectacular list of international awards under her belt including Cake International, Overall Best in Show 2013 and an amazing Cake Masters award for Overall Best In Show 2014! 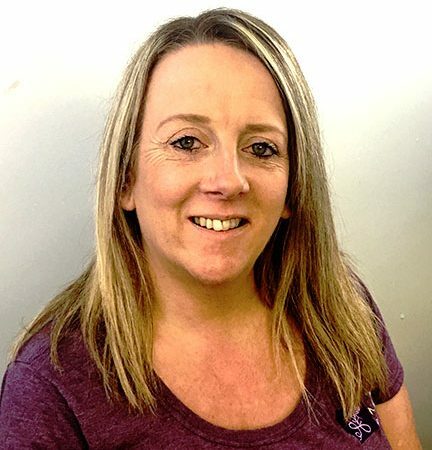 Rose also regularly contributes articles and tutorials to Cake Craft & Decoration Magazine and of course us at the Paul Bradford Sugarcraft School.